I was so surprised by this recipe on Orangette’s blog that I bookmarked it to try when sprouts were in season. Despite its oddness it seems to have found its way round the blogosphere and I discovered several variations. This is my take on it. It has to be noted that Steve doesn’t like sprouts, unless they are overcooked in the British fashion. So while I liked this dish, I was pretty sure he wouldn’t. In fact I knew just what he would say, and I was not disappointed: “It needs lardons in it!” He was more receptive than I expected, but it’s still fair to say that if you don’t like sprouts you probably won’t like this. If you are a confirmed carnivore, you could add prosciutto or lardons to it, but it’s fine without. In fact despite the unusual main ingredient it is a fairly classic northern Italian approach to pasta — a very simple, no-fuss sauce that lets the vegetable used shine: think artichokes, courgettes, or asparagus. So even if you don’t like sprouts you may find inspiration here anyway! Put a large pan of water on to boil for the pasta. 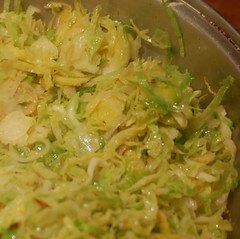 Use the slicing blade of a food processor to shred the sprouts and leeks finely (or use a mandoline or knife). Heat a large, heavy frying pan over a moderate heat and toast the pine nuts, being careful not to burn them. Remove and set aside. Melt butter and oil in the same pan and fry prosciutto till crisp (if using). Remove and set aside. When the water boils, add the pasta. Raise the heat under the frying pan and saute shredded leeks and sprouts, with a seasoning of salt, for about 4 minutes. If they start to brown, add a ladleful of water from the pasta. Add lemon zest and juice, pine nuts, prosciutto, and cream to the sprouts. When the pasta is ready, drain it, reserving a little cooking water to loosen the sauce if it looks too dry. Taste and adjust seasoning. Toss pasta with sauce and serve on warm plates sprinkled with Parmesan. Yummy if you ask me. A possible vegetarian-type pasta that doesn’t need meat. Cream, lardons (or goose fat), pine nuts, lemon, Parmesan, etc. to go with the green bits. And LEEK. Oh, bring it on! . . . (London is cold at the moment. It does sound a bit strange but pasta with broccoli is delicious, so why not? Cabbage would also be nice. (I love cabbage.) I often cut it up and broil it if that’s the word in the microwave with a bit of olive oil, then sprinkle in a generous helping of walnut pieces. Yum. Very warming. Sounds yummy, can hardly wait for the sprout season to arrive!